There exists the implication that if you are driving a Mercedes-Benz S-Class, you are in something that is—at least on a few levels—the very best car in the world at the time it was produced. It’s the S-Class’s entire raison d’être, or whatever the hell that is in German. There are other luxury flagship sedans and coupes, sure. But none of them are supposed to be as good as this. An S-Class isn’t just the best Mercedes, it’s supposed to be a cut above everything else—and a kind of window into the future, a preview of features we’ll see on more normal cars in 15 or 20 years. But the current one’s been around since 2013. How good can it possibly be in a fast-moving, crowded luxury car landscape? Well, having driven an S-Class Coupe around Detroit for a week, I can tell you that I don’t really want to drive anything else now. How’s that for good? Look, I’m not saying I’m not interested in other cars. I am! Of course I am. I’m merely saying that, given the choice, I’d prefer to just drive this and only this from now on. Forever and ever. That’s all. A very humble request, I believe. This particular model was a 2018 S560 Coupe. The S-Class coupe used to be called the CL and the SEC before that. I like the current designation best; CL to me never conveyed the true opulence of the car, and SEC was probably too close to the regulatory agency its owners typically ran afoul of. Either way, it’s an S-Class with two fewer doors, and these models got a host of upgrades for the 2018 model year, including an updated chassis, more advanced semi-autonomous driving features, and best of all, new engines. Despite the throwback name, the S560 gets the 4.0-liter twin-turbo V8 from the AMG GT (and other models here) rated at a healthy 469 horsepower and 516 lb-ft of torque. While down in displacement from the old 4.7-liter turbo V8, it has more power. Impressive figures for sure. Yet you can be forgiven for underestimating the car based on how it looks. It’s incredibly understated, one of the most out of the current Mercedes lineup, trading the downright imposing angles of the old SEC coupes for new sleekness and clean lines. If an old SEC was something you might drive when you wanted people to know that you were, in fact, a brutal oligarch squeezing some town out of billions in tax incentives before you’d even consider building your low-wage factory there, then these new S-Class coupes fly almost gently under the radar. The fact is this car’s true majesty lies within. I will tell you that it’s the inside of the S-Class coupe that’s largely ruined me for other cars. I can think of a couple Bentleys or Rolls-Royces (or maybe the Panamera) that could give this a run for its money, but the S-Class is easily among the three or four best car interiors you can buy right now. It’s as gorgeous as it is high quality. You could spend hours hunting for the same cheap plastics that dog pretty much every other car and you’d come up with nothing. Here, everything is brushed aluminum and all-leather soft touch you name it. All of it is just so quiet, comfortable and isolating from the daily horrors of the outside world. Cars right now don’t get a whole lot better than this on the inside. While in Detroit we also had a Jaguar F-Pace crossover and a Chrysler 300. Sitting in those cars just made me kind of sad and lonely after spending time in this one. When you step inside, a robotic arm—which has a speaker built into it, naturally—hands you your seat belt, and if you miss the window when it’s available a button brings it back. Reaching over your shoulder is for lesser cars. Points go to the two wide rectangular screens that sweep across the driver’s side and center of the dashboard, offering ample real estate for a wonderful set of digital gauges and a map and infotainment system. I took to the touchpad control system on the right (they’re not touch screens, however) quicker than I expected. Entering addresses could be done via a Google-like search function rather than a hard and fast system of entering exact towns and house numbers. I like that newer cars are getting better about that. Here, it worked pretty well for finding our way from one Detroit Auto Show event to the next, most of the time. That’s only the tip of the gadget iceberg, of course. Other items—all of which you will wonder how you lived without for so long—include a cabin fragrance diffuser (recharges run about $100 a pop), a smooth nine-speed automatic gearbox, heated and cooled seats with more massage options than you’ll ever need, fully customizable interior ambient lighting, active cruise control with steering assist and dashboard infrared night vision that can be enabled at the touch of a button. Yes, the car has night vision. I could literally use the S-Class coupe to fight crime, it has so many gadgets. Which I was tempted to do, because I hate crime! So much. At first I thought the car we were picking up would be an AMG model, specifically the AMG S63. 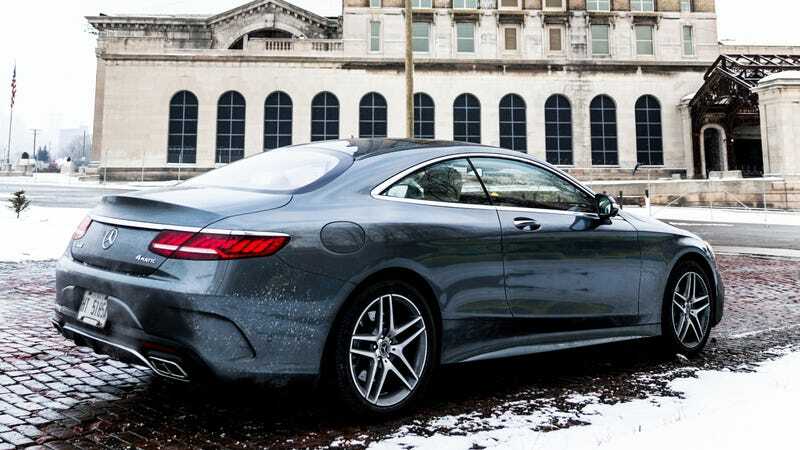 I needn’t have worried, as being a hot rod AMG model—while providing almost absurd levels of power and acceleration—almost diminishes the stately, above-it-all nature of the S coupe. Brutal speed? Loud noises? Please. That would be almost uncivilized, this car practically declares. Let me tell you that while the AMG edition gives you bragging rights and brand snobbery, the S560 is objectively great on its own—and quick. The new engine delivers immediate and direct thrust, but it stops short of being overwhelming or violent. It’s too good for any of that. Step on the gas and it simply rockets past all of the lesser cars on the road, with little regard for what those other drivers may think of it. The whole package is thunderingly powerful without being overly obnoxious. Have you watched that scene in Netflix’s Castlevania where Trevor and Alucard are fighting, and Trevor takes a cheap shot below the belt, only for the vampire aristocrat to say “This isn’t a bar fight; have some class”? This is that scene, in car form. This ethos extends to things like handling and steering as well. Though it weighs in around 4,600 pounds, the S560 never feels like a boat. In fact, it was quite agile, composed, and easy to park. I was genuinely surprised at how flat it stayed in twisty on-ramps while maintaining a soft, gentle ride quality. The steering has that overboosted, feel-less quality to it, but the car was still easy to point and shoot wherever I needed it to go. It’s a masterpiece in control, and in balance, impressive for a big luxury coupe. Honestly, I can find few things to complain about here, but a big one was climate control. Of all the S-Class’ many systems, this was the most perplexing; despite the array of physical buttons on the dash, getting it to blow exactly as I wanted proved elusive time and time again. We never figured out how to get the rear ventilators to work, or the heated steering wheel, if there even was one—and regardless of packages, there should be at this price. In fact, a hunt through the climate settings led to three options: FOCUS, MEDIUM and DIFFUSE. This is why people get mad at modern cars. But all of this is nitpicking for a car I was genuinely sad to part with as we left Detroit, something that rarely happens to me anymore. I don’t have a full spec sheet to give you pricing, as the 2018 models technically don’t go on sale for a few more months. But the old S550 started around $120,000, and near as I can tell this one had about $25,000 in options based on the configurator for the outgoing car, so let’s put it at around $150,000 to be on the safe side. Worth it? Many people will see that as supercar or expensive Porsche 911 money. But I believe I’ve found a better way. The fact is, I’d take this over most supercars. Maybe I’m getting old. Maybe the thought of cramming into a tiny two-seat carbon tub for some track time would be fun every now and then, but seems like it’d be exhausting every day. Maybe living with this level of comfort, tech and power is more appealing to me. Maybe this thing really is better than most everything else out there right now. It’s hard to say no to, that’s for damn sure.